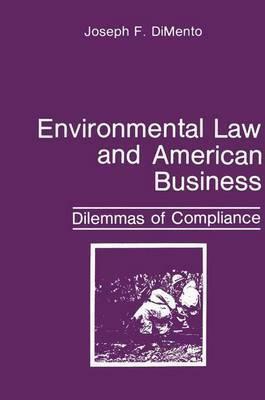 We are in the second decade of modem environmental law. By some indicators this body of regulation has matured greatly. We can point to statutes and codes at the federal, state, and local levels which address almost every conceivable form of pollution and environmental insult. Yet, despite the existence of this large body of law, despite considerable expenditures on enforcement, and despite the energetic efforts of people sympathetic to environmental objectives, violations are numerous. Serious pollution problems are commonplace. Love Canal, the Valley of the Drums, Times Beach, and Stringfellow Acid Pits epitomize the national environmental quality challenge. Daily, a major illegal disposal of haz- ardous waste is recorded; a new mismanaged dump site is discovered; a toxic substance is found in our drinking water; or a failure to meet a water or air quality standard is identified. Many of these violations involve American business. Failures to comply are of several types. A small businessman in Pennsylvania mistakenly allows a spillover of a pollutant into a protected stream. An industrialist in the Midwest adds to his fortune by illegally dumping dangerous chemicals. A series of errors by several firms, some of which no longer exist, combine to create a health- threatening conflagration on the West Coast. An automobile company interprets one of the almost innumerable air pollution rules differently from government: It produces a car which the government says fails to comply with the Clean Air Act. Illustrations note XVI, 228 p.
1 Mushrooms and Mercuries: Cases of Noncompliance.- 2 The Noncompliance Problem.- 3 Pursuing Compliance: Society's Tools.- 4 The Behavior of Compliance: A Short Introduction.- 5 "They Treated Me Like a Criminal": Sanctions, Enforcement Characteristics, and Compliance.- 6 The Behavior of Compliance: Communicating Law.- 7 The Actors.- 8 Making Environmental Law Work.